Why Your Website is Losing Attention And How to Fix it? Are you afraid of losing customers visiting your website? 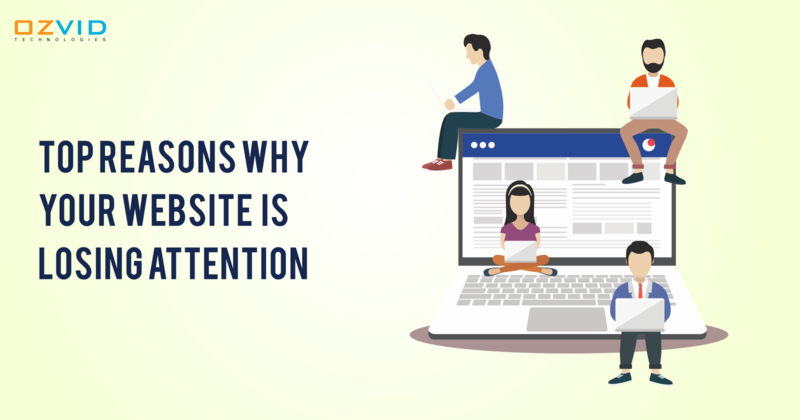 Or is your website getting less attention from the visitors? Or you are already struggling with falling customers? And the websites which were already getting good attention and suddenly experience falling visitors, it becomes a thing to worry about. Isn't it? There is a stiff competition in this tech world where customers demand perfect services from your website, and if you fail to do that, you are out of the race. Not only that you lose the customers, but you lose their trust forever. Why customers are losing interest in your website? You need to make sure that you know what your customers expect from you and are you able to reach customer expectations or not. Simply because if you lose that visitor, you lose him forever. And if your website isn't perfect for the customers, then you would be certainly missing something major or you are committing some mistakes. So, here is a list of top reasons that why you are losing customers at your website. Outdated design: The first thing that attracts the customers is your website design, the way you present yourself is the most important part. You need to have catchy designs and update the design after a while so that you are up with the competition in the industry. You must build an appealing website which can attract the customers. Clear navigation structure: Having navigation structures which are complicated and not user-friendly is just not preferred by customers. Nobody has enough time to keep on searching for your services all over the website pages, rather they'll simply switch to another website. So, you need to have clear and easy to find navigation structures. Improper & outdated content: Having an attractive design is a good thing, but what rules your website is the content. You need to make sure that the content is up to date. It's quite obvious that after a while you add/remove certain services from your business, you need to update the content accordingly and stay up to date. Old plugins: No user will install the outdated plugins to use your website services. Isn't it? So, having old plugins on your website would be a bad idea. You can use HTML5 for videos and animations in order to deliver a better customer experience. Auto-play videos: Whenever a customer visits your website, he/she never expect a video to autoplay. In fact, people need complete flexibility about what they want to view and what not. So, simply try avoiding auto-play videos over your websites. Slow loading websites: Users simply hate the websites which have slow loading speed. And the worst consequence of having a slow website is that you lose that customer forever. Majority of the users wait for hardly 2 seconds over the website, else they switch to some other alternative. Call-to-action: As estimated, nearly 80% of B2B websites are missing call-to-action buttons. You must ensure that your website has the button so that it becomes easy for the customers to get in touch with you and know your services better. Looking for a vendor which offers the best web app development services which are perfect for your business requirements? OZVID Technologies is one such ideal vendor which can cater to all your website requirements in the most affordable way. Want to know more about us? Connect with our team and know about our exciting services!